Author, Actress, Princess, and General, Carrie Fisher Passes at 60. I know I’m not the first to post this. But it’s with a heavy heart to report that Carrie Fisher has passed today, she was 60. 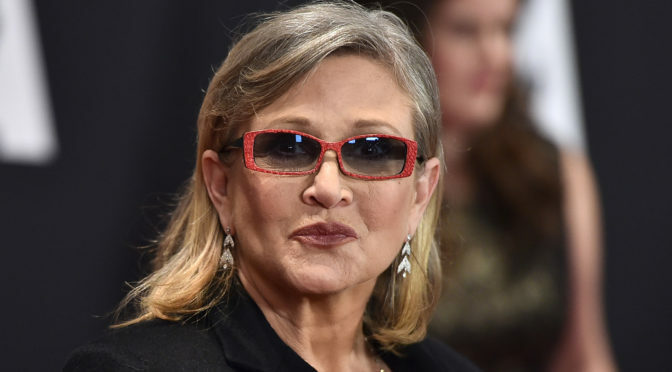 As widely reported, Carrie Fisher suffered a heart attack last week while travelling from London to LA for the holidays. Since then, she was treated, and rushed to the hospital. Since, despite mixed reports, it was finally confirmed that she was in stable condition. And the world of family, friends, and fans were pulling for her. I know, without a doubt, I will miss her profoundly. I don’t think it’s a big secret that Carrie Fisher was a child of Hollywood royalty, being born to actress Debbie Reynolds and singer Eddie Fisher in 1956, and I’m sure other news outlets breaking this news have recounted that history already. But for me, I may not have had the pleasure to know her personally. But the hand she had in telling some of the stories that impacted my life, be it STAR WARS, her scripts, novels, even her memoirs… I will always be grateful for sharing those moments. And knowing that light is gone is truly heartbreaking. Carrie Fisher is survived by: her mother, Debbie Reynolds; her daughter, actress Billie Lourd, whose father is CAA co-chairman Bryan Lourd; her brother Todd Fisher; and her half-sisters, actresses Joely Fisher and Tricia Leigh Fisher. So much love to the family during this difficult time.